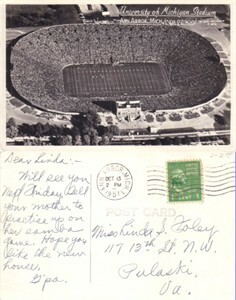 Original black and white photo postcard issued in 1949 showing an aerial view of Michigan Stadium in Ann Arbor just after it was expanded to seat a record 97,000+ fans. Has a few hairline surface creases, otherwise only minor wear. Postmarked Oct 13, 1951 in Ann Arbor (stamp intact).